When a forklift ramp is unreliable and unsafe, it can be a significant problem for a loading dock operation. If people are going to be loading and unloading all day, the yard ramps also need to be able to handle the workload. Copperloy is one of the leading manufacturers of some of the safest and most durable yard ramps in the industry. These forklift ramps can substantially increase safety and productivity, making the entire loading dock operation smoother. With a modern, one-cylinder design, Copperloy ramps apply much less pressure than their two-cylinder counterparts. They also provide significantly improved stability, quicker raising speeds, and much easier operation. In addition, the hydraulic pump is located on the outside of the ramp for convenient access. Copperloy forklift ramps are resistant to the average wear and tear you see on other loading dock ramps. Their yard ramps have unparalleled longevity, making Copperloy a top provider of products with high strength and stability. 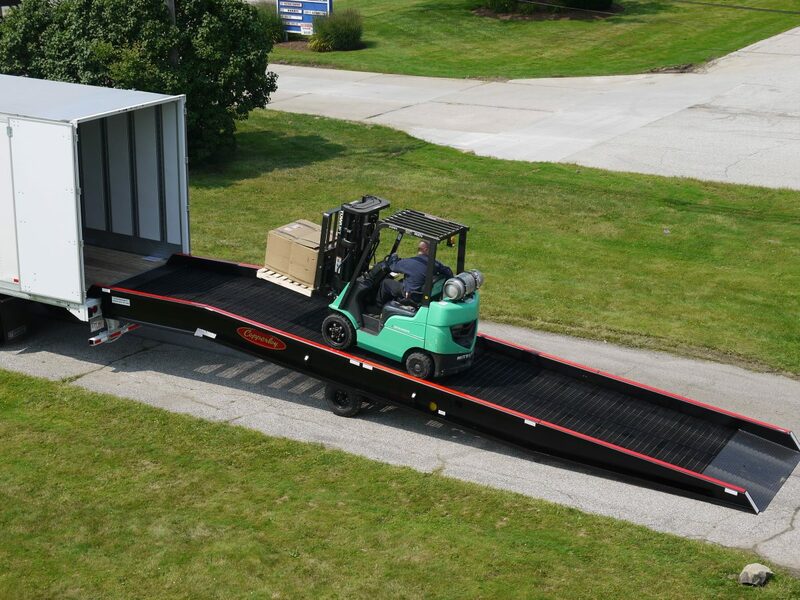 Each of their yard ramps also has multiple features that have invaluable utility for any loading dock operation. 8-Foot Level Off: This level-off is a prominent feature of Copperloy ramps. It allows for much smoother access for forklifts onto platforms, trucks, and loading docks. Hydraulic Pump: Copperloy designs their ramps with the hydraulic hand pump on the outside for much simpler access. This single-acting hand pump is much more convenient than other industry ramps. In its location, it is shielded from the dirt and damage that comes about with loading dock operations, saving time and money on repairs and maintenance. Low End-Plate and Safety Curb: On other yard ramps, forklift access can be a troubling experience. However, Copperloy has designed their forklift ramps with a low end-plate that is shorter than a forklift’s wheelbase. This allows forklift wheels to access the grating with the back wheels firmly planted on the ground. In addition, there is a seven-inch safety curb to prevent runoff, creating smooth travel for any forklift using the ramp. Solid/Pneumatic Tires: Copperloy recognized that air-filled tires require constant refilling and maintenance. Therefore, they design their forklift ramps with solid, pneumatic tires. These solid tires come with well-lubricates bearings, giving them significant reliability. This is only a short list of the many advantages that Copperloy products can provide. Any business looking to make large improvements to productivity and safety should consider Copperloy loading ramps.